Cataracts are a common health condition, but many people still do not understand the causes, symptoms, and their own risk factors. The good news about cataracts is that, with early treatment by your eye doctor, treatments including cataract surgery in Chicago can save your vision and prevent permanent eye damage. In honor of May’s Cataract Awareness Month, take a moment to learn about this common vision problem and ways you can save your sight if it happens to you. Cataracts cloud the lenses in your eyes, obscuring your vision. They can occur in one eye or both, but they are not contagious and cannot be transferred from one eye to the other. According to the National Eye Institute , over half of people over age 80 have at least one cataract or have had cataract surgery. Although they are commonly associated with aging, anyone can develop a cataract at any time. Cataracts are caused by proteins in your lenses that clump together to make your vision look cloudy. Age is the most significant risk factor, but smoking, excessive alcohol use, excessive sun exposure, and some chronic diseases, such as diabetes, can also increase the chances of developing cataracts. The first symptom many people with cataracts notice is cloudy vision. You may also notice that colors seem faded or that you’re experiencing double vision in the affected eye. Glare from headlights and lamps often seem more intense with cataracts, and night vision may worsen. Needing to adjust your eyeglasses or contact lenses prescription frequently could be the result of a growing cataract. For some patients, eyeglasses work as an initial cataract treatment. If the cataract grows, surgery may be necessary. 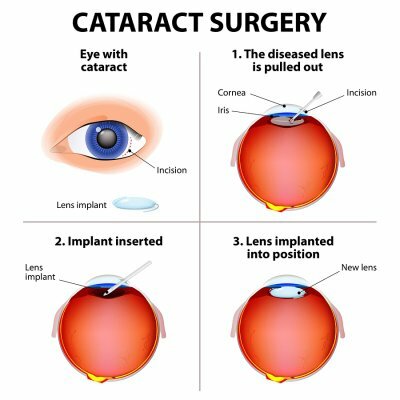 During cataract surgery, the damaged lens is removed and replaced with an artificial one. Even if your cataract does not interfere with your vision, you eye doctor may recommend that it be removed if it makes eye exams difficult or makes it more complicated to treat other eye conditions.